It's always nice to be surprised by the toys you buy. There are some things you get out of idle curiosity that turn out to be more than the sum of their parts. That seems to happen a lot with GI Joe. Duke is fluent in several languages and graduated top of his class at Airborne School, Fort Benning. Calm and determined, he commands by winning respect. He turned down a battlefield commission because it would distance him from his troops - and from the center of the action. As the GI Joe team's field commander, Duke demands only top-notch performances from everyone, but it's nothing he doesn't also require of himself. He met his equal in Red Star of the Oktober Guard, respecting the Russian soldier even as he fought to defeat him whenever they crossed paths. This is a rather unusual figure - unlike Hawk, who I mistakenly thought this figure represented, Duke's never worn the plain greens. He was already in his familiar tan shirt when he first showed up, and he was brought in from outside at a time when the Joes didn't have the Greenshirt program. Of course, since the green uniforms are so plain and interchangable [that's why they call them "uniforms" --ed. ], you can call this guy whatever you want. Have him be Grunt or Short-Fuze or any of the other originals you'll never get any other way. Construction is simple - it's the existing G3 Duke head on a repainted Snake-Eyes body. For the most part that's fine, since it gives us a lot of neat details on the suit, like the pouches on his arms or the straps on his legs. The downside? Duke's bare hands have obvious wrinkles meant to suggest gloves. Ah, minor complaint anyway. The uniform is the basic Joe green, while all the details are painted brown - even the laces on the black boots get brown aps. 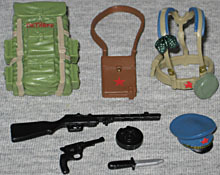 Duke's accessories are a green helmet, a brown bandolier with a silver grenade, a black pistol, knife with silver blade and black handle, and a black M-16. There's also a new pair of binoculars, which hang around his neck on a brown strap. There's a sheath for the knife, but no holster for the gun, so he'll always have to be holding that along with the rifle. Dual-wielding Duke! 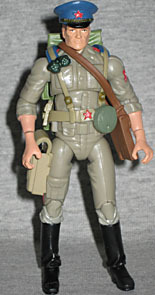 Red Star commands the Oktober Guard, which is the Russian version of the GI Joe team, and was formerly part of a "crack" Black Sea Regiment of the Soviet Naval Infantry (the equivalent of the United States Marine Corps). He was the youngest chess master in Odessa at the age of eleven, and is a published Pushkin scholar, his monograph on "Boris Godonov" being considered the definitive work. In his spare time, he coaches the pistol team at the Dynamo Sports Club in Moscow. 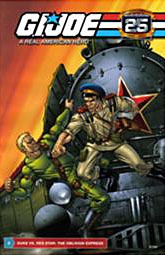 Red Star was introduced after the Oktober Guard's previous leader, Col. Brekhov, was killed in action. For some undisclosed reason, however, Red Star looked and acted just like Brekhov. He was also the only Oktober Guardsman to ever get a toy in Generation 1, for what that's worth. Amusingly, while the Duke in this set is wearing an atypical green uniform, Captain Krimov is made from Duke's body with a new head and boots. Red Star's uniform is grayish-beige, which is an unexpected choice. That's the color of Brekhov's uniform - Krimov always wore brown camo. If not for the big blue hat, there'd be no clue this wasn't supposed to be Ivan. The hat is removable (which really undercuts the suggestion that Wild Bill's tiny head was only to accommodate his hat), and the face beneath it looks remarkably similar to John Wayne. The Duke as a Communist? Isn't that some sort of blasphemy? We get a really nice assortment of accessories, here. Beyond the hat, there's a new rifle (with removable ammo drum), a pistol, short knife, a brown satchel, new webgear and a sizeable backpack. Quite an assortment! It's interesting to note that both Duke and Red Star come with both a knife and a pistol, but while Duke has a sheath and no holster, Red Star has a holster and no sheath. These guys can't agree on anything! Since this is a Comic Pack, things would be remiss if it didn't include a comic. This is one of the books that sort of (but not quite) fits into the old Marvel continuity, but not one of the ones that gets a nifty "½" numbering. It's just #6, "The Oblivion Express," and features a new Larry Hama story involving the two characters fighting their way through a hijacked train. Red Star is a really unusual choice for a character to get a Generation 3 update. He came out before a lot of the more "classic" characters, like those in the Assault on Cobra Island set, but he's well done and has great accessories. Even the greenshirted Duke, a figure I thought I'd be tossing in a box and ignoring, turned out better than expected. I kept passing on this set every time I saw it, but now that I've opened it and played with the figures, I'm really glad I grabbed it when I did.